We got a bunch of Fuyu Persimmons in our CSA box so we decided to turn them into jam. This is my first attempt at making jam of any kind. I’m quite happy with the way it turned out. This jam is super good on toast or on Tartines (French open faced sandwiches). Peel and dice persimmons. Add to a pot with sugar and cook down over medium-low heat until the fruit is soft enough to mash. Mash the fruit as it thickens. Add honey and lemon juice. Heat until everything is incorporate well. Remove from heat. Pour jam into lidded canning jars (1/4″ from the top). If you’re going to use the jam right away, the rest doesn’t really matter. Just keep it in the fridge as you use it up. (This is what I did) If you want these to sit in the pantry for awhile, follow the rest of the canning steps to properly store the jam… Note that the remaining instructions are borrowed from the great internet expertise of canning steps. Filling the jars: Using your funnel in each jar ladle the mixture into the jars leaving 1/4″ headspace. Taking a clean paper towel wet it with warm water and wipe the rims of the jars removing any food particles that would interfere with a good seal. Using your magic wand extract the lids from the hot water and place them on the now cleaned rims. Add your rings to the tops of each of the jars and turn to seal just “finger tight”. Processing: Place the jars in the water bath making sure that the water covers each of the jars by 1 to 2 inches. Add hot water to the canner if it doesn’t measure up. Cover the pot and turn up the heat under the canner and wait for the water to start boiling. Once the water has come to a boil start your timer for 10 minutes. When complete turn off the heat and remove the cover and let the jars sit for another few minutes. Remove the jars and place them back on the dishtowel in a place that they will sit overnight to cool. Do not touch or move them till the next morning. Sealing: Sometime in the next hour your jars will be making a “pinging” or “popping” noise. That is the glass cooling and the reaction of the lids being sucked into the jar for proper sealing. Some recipes may take overnight to seal. Check your lids and reprocess any jars that did not seal. I had to take a picture of this amazing jam before I ran it all out. You see, my aunt always gets me the best gifts (even though this was picked out by my uncle). They tend to be hand made or local items. For Christmas, they gave me a gift box of three jams and this one was in it. 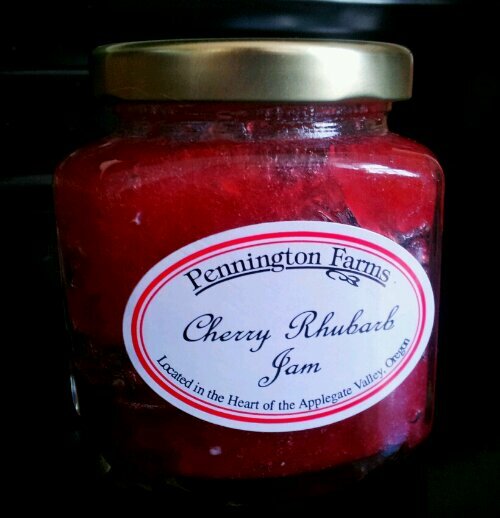 This is a Cherry Rhubarb Jam made by Pennington Farms in Applegate Valley, Oregon. I was very sceptical of this jam at first because these aren’t traditional jam flavors like strawberry, blackberry, blueberry, or marionberry. But let me tell you this, this is the best “store-bought” jam ever! If you want to know more about Pennington Farms or want to order some of the delicious jam, head over to their website here. When I looked at their ordering page this jam was not listed among those to choose from. I don’t know if they ran out or not so you might have to ask for it by name. I still have two more flavors of jam to go through once this is gone and I am so looking forward to it. Heat oven to 400ºF. Lightly grease spring form pan. In medium bowl, stir Bisquick, milk and egg until blended. Spread half of the dough in bottom of pan. Top with half each of the cheese, ham and turkey. Spread jam over turkey avoiding the very edges of the pan. Top with remaining ham, turkey and cheese. Spread remaining dough over cheese to sides of pan. Bake uncovered about 30 minutes or until golden brown. Let stand 5 minutes before serving. *Often times people dust this with powdered sugar but we don’t and it’s still tasty!